Freshly extended and developed . Fully equipped air conditioned property well maintained with gardens and large 2.3m depth swimming pool. Superfast wifi,latest appliances and Sonos/Bose music system inside and out with 55ins TV with world channels and Apple Tv/Netflix etc. Ample outdoor furniture is available to sunbathe with 8 loungers and padded cushions and beach towels.Retractable sunshades over the main patios and 2 super large umbrellas complete the shading. An outdoor sofa and chairs on the main terrace with coffee table is a super place to chill. A large cushion storage box is adjacent to the outdoor shower for easy access.Small drinks tables are next to the loungers. The Bose outdoor speakers ensure any sounds from neighbours are minimised.Please respect their privacy and keep music to acceptable levels. You have 3 outside dining area choices! A large outdoor table on the terrace outside the kitchen seats 8 comfortably.A side terrace also has an 8 seater table for breakfast in the morning sunshine.The end sunset terrace also features a further table for late evening drinks & food . The well equipped kitchen has latest appliances from Neff/Siemens etc.An induction hob and retractable extractor system are in the kitchen island with overhead lighting.Ample glasses, dinnerware and cutlery is available to avoid constantly using the integrated dishwasher.A twin sink and kettle,4 slot wide toaster and Phillips Intuita fresh bean to cup coffee maker complete the drinks making.Full instructions on how to operate are included in the manual in house.Microwave and induction oven are also available.A walk in pantry and cupboards have super space for groceries. Twin fridges and small freezer will amply cope with storing all fresh food.A round 8 seater dining table with chairs is an option for inside dining. The lounge area has a large corner sofa and stools and square glass coffee table. The 55 inch Satellite tv on a swivel bracket has access to all English and German Tv and ALL world TV stations and BLu Ray player.Access to Netflix and other apps via Apple TV . The Home cinema sound system will give real surround and super bass to add to the thrill of films.There is also a library of DVDs and an additional DVD built into a 22 inch TV which can be placed in any bedroom perfect for kids. All bedrooms feature comfortable beds with superior bedlinen, pillows and reading lights.All have aircon with additional ceiling fans and table fans.Windows are shaded with blackout curtains or blinds and some have additional shutters.Towels, bathmats and hairdryers are available in each of the bathrooms.All linen is changed each 7 days. The Master bedroom features a super-king bed with super views out to the ocean and mountains.On the balcony outside are 2 chairs and table for quiet contemplation!There are 3 fitted wardrobes with double hanging and single hanging and internal lighting with ample hangers .A large 6 drawer unit for folded clothes and 2 easy chairs .Integrated bedroom reading lamps are fitted into the headboard.Curtains are blackout proof and thick.A ceiling fan is also available to supplement the aircon if desired.The windows can be retracted and shutters ( hidden inside wall ) can be pulled out instead for natural air circulation at night if preferred. The master bathroom has idyllic views with large bath and attached hand shower and twin sinks with concealed mirrored bathroom cabinet.Inside a hairdryer and shaving point are available.A rainwater shower and handheld shower and integrated seat are in the shower cubicle. The second bedroom & bathroom is identical to the master in all aspects but also has a 2seater sofa. Bedroom 3 has a king bed with 2 double fitted wardrobes with internal lighting and ample hangers. The bathroom features a single sink and rainwater shower with handheld additional shower. Bedroom 4 on the ground floor has 2 single beds which can be pushed together to form a superking bed.The wardrobe is open and freestanding and there is a large 5 drawer unit and additional 3 drawer unit.The room is accessed by a sliding wall/door which can be closed from the inside. You have direct access onto the morning sunset terrace outside.You can also access directly the ensuite bathroom via a "Jack and Jill " sliding door.Bathroom 4 also serves as the ground floor guest bathroom.It has a single basin with under-drawer storage and a rainwater shower with seat and handheld additional shower. A gym is available in the basement with agreement from owner but at your own risk.Please be sensible.Free Weights, kettle bells ,Elliptical trainer, Spin bike and Static Functional trainer are available. Our personal trainer can also be booked in advance at www.mypersonalt.es. We have a massage couch next to the gym for treatments. A local therapist can also provide massage in the gym or beauty treatments, reflexology and pilates.Early booking required to guarantee. www.sarahsantacruz.com.She lives adjacent to our house and comes personally highly recommended! A small study is available off the main living room with desk and access to high speed fibre broadband. Transmitters in garden and upstairs also ensure good signal coverage throughout the house and garden.No computer or printer is available for guests. 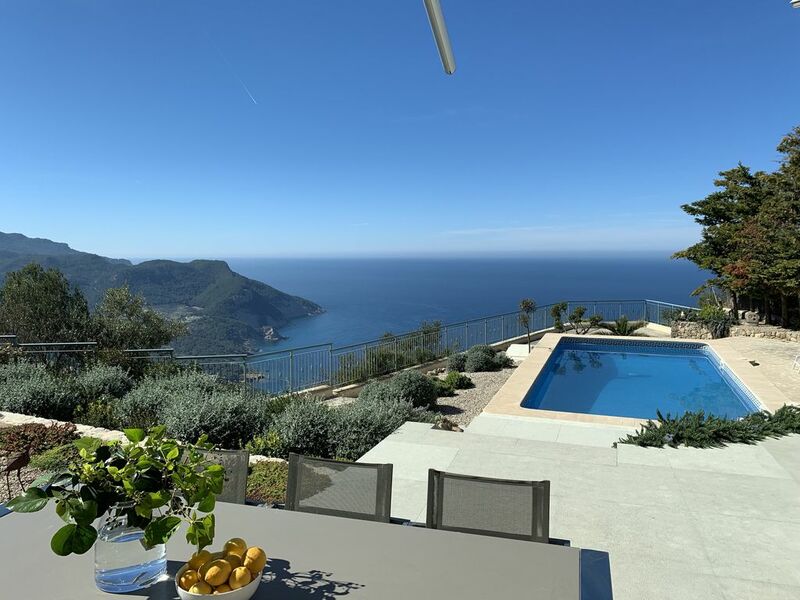 We travelled all around the Deia/Valldemossa area for 5 years before we eventually found this house with its simply stunning views.You can spend hours just gazing at the mesmeric mountain views or the sea and area in front of the terrace. The unbelievable stunning vista with 1500 metre drop and combination of mountains and sea. Never a dull view! toilet, tub, shower, twin sinks and fabulous views! All bathrooms have electrical sockets for hairdryers either concealed in the mirror fitted cabinet or on the tiled wall.Hairdryers in each bathroom also. In all rooms with sensors fitted to windows to switch off if windows are open. In winter there is underfloor heating. Each 7 days new sheets and pillowcases are washed and replaced. Pillows are also provided. Wood is not provided . Fibre fast WiFI. Install Sonos app on your phone to play your own music in our house. Easy!Bluetooth speaker also available for inside outside instead. Beach towels, hand towels and bath towels are provided for each guest. These are refreshed each 7 days. Elliptical trainer, static bike, functional weights trainer and free weights are provided. Our personal trainer can be pre booked in advance if enough notification. Massage table for treatments also. Latest Neff convection electric hob and concealed Neff extractor fan. Latest Neff oven with slide in door. Saeco/Phillips espresso and cappucinno maker grind beans from fresh. Fully equipped with lots of storage and walk in pantry. World Tv including all English ,German etc . Download the SONOS App via WIFI to play through sound system. Walking books and maps available. There is a SMALL STUDY for busy execs who cant keep away from work. I 100s of Dvds categorised under Thriller to RomCom to Foreign to Arty!! Please replace in correct section. Recently landscaped with fresh meditterreanean authentic plants and herbs.Astroturf area to side of house. 2 upstairs balconies with 2 chairs and cafe table. 2.3m deep at end.Not heated. Thank you Andrew.We are so glad your group enjoyed the house and the area. Spectacular home (better than in the pictures) with a view to die for! Near to the quaint village of Valldemosa which is fairly popular. Focus of this property and surroundings is complete relaxation and disconnecting. Wonderful hiking nearby. Owner Mark was available and accommodating at all times & when needed. Would definitely go back. Everything was perfect. High standard house, big clean pool and one of Mallorca’s best views. Thank you. We are so pleased you had a great holiday and hope Valldemossa lures you back another year! We had the most amazing week in this luxurious villa. The view is to die for and we spent the week enjoying the every changing vista. Externally the gardens were exquisite with as much attention to the outside as the inside ( with an added Buddha !!!) Internally the villa has everything you need for a family holiday although some of the technology was hard to master (hob) although good excuse to not do a lot of cooking !!! Our 3 kids 16,and 11 year old twins loved the space, comfort, pool and T.V and were really sad to leave. The situation couldn’t be better for a cycling mad husband who managed 5 days of hill climbing for a couple of hours each day from sunrise and Valldemosa was lovely to wonder around although we only left the villa for 2 nights, the pizza restaurant as you enter Valldemossa was excellent. Our stay was further enhanced by the lovely housekeeper Mimi who made us feel very welcome and assisted us in anything we needed during the week. We couldn’t recommend this villa highly enough and hope we can return one day for another idyllic week. Thanks for letting us share your little bit of paradise Mark. Jill,I am so pleased you had a great holiday with your family. Thankyou for your comprehensive review! You are very welcome to come again ! So glad to hear you enjoyed your holiday! thanks for you feedback. Diese Haus bietet wirklich alles, was man sich für einen erholsamen Urlaub vorstellt. Die Zimmer sind liebevoll eingerichtet und der Besitzer hat an alles gedacht, was man so im Urlaub benötigt. Purer Luxus mit vielleicht einem Tick zuviel Technik! Überwältigend ist die Sicht hinter dem Haus! Das Haus liegt auf einem Felsvorsprung direkt über dem Meer. Meer, Wellen, Himmel, Sonnenuntergang,... alles zum Bestaunen, Geniessen und Erholen! Thankyou Claude.We are so glad you and your family enjoyed your break in Valldemossa. This house really offers everything you would expect for a relaxing holiday. The rooms are lovingly decorated and the owner has thought of everything, what you need on holiday. Pure luxury with perhaps a bit too much technology! Overwhelming is the view behind the house! The house is located on a rocky outcrop overlooking the sea. Sea, waves, sky, sunset, ... everything to admire, enjoy and relax!